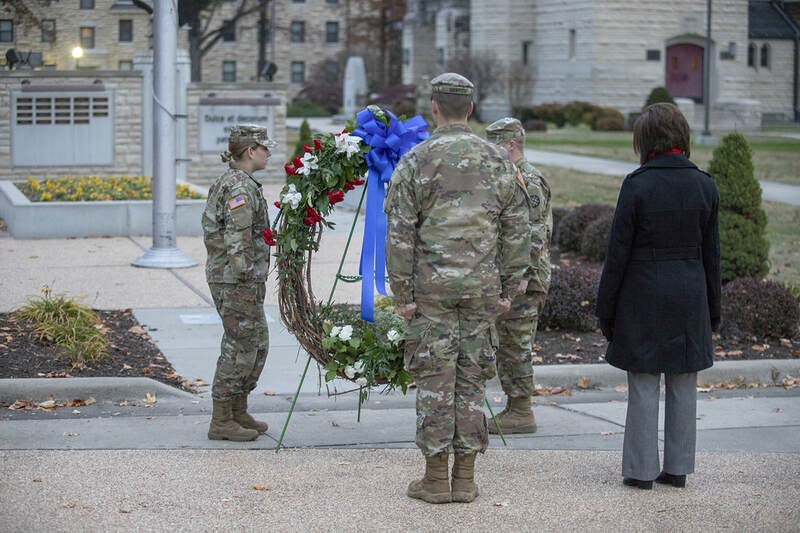 Dr. Marci Linson, vice president for patriotic activities and dean of admissions, joins in the ceremony of the laying of the wreath on Monday, Nov. 12, 2018. College of the Ozarks honored Veterans with numerous events and ceremonies during the week of and prior to Veterans Day, Sunday, Nov. 11, 2018. On Wednesday, Nov. 7, College of the Ozarks broke ground for The Global War on Terrorism Memorial at Patriots Park on the College campus. The dedication of this memorial reflects the patriotic goal of the College: to encourage an understanding of American heritage, civic responsibilities, love of country, and willingness to defend it. On Monday, Nov. 12, a sunrise, flag-raising ceremony took place at the heart of campus by Williams Memorial Chapel. A wreath was laid, and Cadet Daniel Andrews, senior public relations major, gave remarks. Lain McCanless, senior public relations major, and Cole Howerton, senior video production major, shared about their experience on the Heilman American Patriots Tour through the Patriotic Education Program. From 8 a.m. to 5 p.m., Monday, Nov. 12, C of O students, staff, and faculty read the names on The Missouri Vietnam Veterans Memorial, located at the entrance of the College of the Ozarks campus.